← Eight Pounds and Counting! It seems that I get emails from people who want to know more and more about me. To answer a question I received this week, I will tell you what my favorite movie is and why. My mother told me that she and my dad had seen the flick when I was a baby in 1958 and it had touched her heart. So it became a kind of tradition that she and I would wind up watching the movie each time it was aired. It has ever since, been my all-time favorite film, although most seem to incorrectly believe that the honor belonged to The Wizard of Oz. It may be true that I can quote the entire fantasy film verbatim from the opening line to “Oh Auntie Em, there’s no place like home,” but that is another whole phenomenon that even I can’t truly explain. The fact of the matter still remains that “Inn” is the movie most near and dear to my heart. Maybe it was the fact that it came into my life at such a very happy time for me personally. Or maybe it’s because it was something shared between my mother and me. Maybe I simply love the story. Perhaps it’s all three, but I just adore the movie. 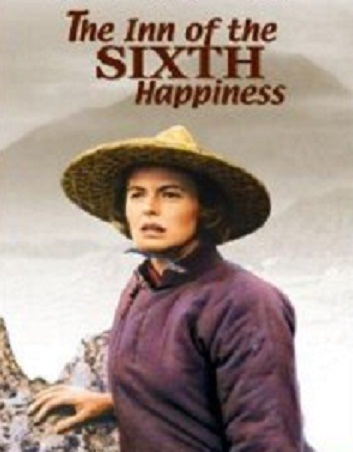 Based on the Alan Burgess novel “The Small Woman,” The Inn of the Sixth Happiness follows the life of Gladys Aylward as she makes her way to China during the tumultuous 1930’s. The film stars Ingrid Bergman as Gladys, a real-life Christian missionary of the day. Against the very practical advice of just about everyone she encounters, including Dr. Robinson, the man who was the senior missionary, Gladys heads into the war-ravaged region to help spread Christianity. When Gladys Aylward felt the calling and volunteered to become a missionary in China, Dr. Robinson, the senior missionary rejects her offer. He out and out refuses her permission to become a Chinese missionary because she was, in his opinion, not qualified. He did however secure Gladys a housekeeping position at the home of a wealthy explorer. There, she uses her employer’s vast library to gain as much knowledge about China as she could possibly absorb. She saved her money to purchase her own ticket aboard the Trans-Siberian railway to make her way to China. It was a very dangerous journey, but she chose to travel as inexpensively as she could in an effort to get to China as quickly as possible. Gladys settles in the quaint town of Yang Cheng, where Jeannie Lawson, an elderly missionary is in desperate need of an assistant at the Inn that she was setting up for traveling merchants. It was customary for the Chinese to tell and listen to stories as they ate their meals, and Ms. Lawson figured it was the perfect opportunity to impart some wonderful Bible stories to her captive audience. After an accident causes the sudden death of Jeannie Lawson, Gladys finds herself having to take over running the Inn, now named The Inn of the Sixth Happiness. She receives two powerful allies. One; Lin a general in the Chinese military and the other; the elderly Mandarin of the region (played by Robert Donat). The Mandarin finds Gladys to be a very stubborn yet charming westerner, and eventually appoints her as his Foot Inspector. Although outlawed, the mountain people were still following the antiquated tradition of binding the feet of their female children. This practice was not only very painful; it also caused the feet to become deformed. Gladys was already somewhat of a legend in the region due to her kind, tender and caring Christian ways. The local people had great love and respect for the British immigrant. In fact Gladys’ name had even been officially changed to Jeni, “the one who loves.” The mandarin was hoping to use that respect and love in his favor to help eradicate the outdate practice within the region he governed. Jeni was not only extremely successful in her task, but during her travels through the county she stumbled upon a dangerous prison revolt. She worked as a liaison between a man named Lee who represented the disgruntled and mistreated prisoners (of which he was one) and the jailers, to settle the dispute calmly, without violence. This sealed her acceptance by all of the Chinese and the loyalty of Lee forever. However it is during this time that China is being invaded by Japan and Jeni is encouraged by both Lin and the Mandarin to flee the country. Feeling that she was now a true Chinese, she refuses. Eventually the Japanese make their way into the tiny town of Yang Cheng forcing the population to evacuate. As the people prepare to leave the village, the Mandarin makes one final public proclamation, announcing his conversion to Christianity, inspired by the Christian love displayed by Jeni. Aylward is overcome with emotion, but is now left alone with 50 orphans she had accumulated from the war-torn region (five of which were her own adopted clan). Aided by Lee, the former leader of the prison revolt that she helped to resolve, Jeni makes plans to evacuate the children. Lin tells her that the only hope is to take the children to the next province, where trucks will drive them to safety, but they must get there within three weeks, or else the trucks will leave without them. Just as they are preparing to leave, another fifty orphans appear from a neighboring town, so Jeni and Lee have no choice but to lead one hundred children on a trek across the countryside. Although it should only have taken them a week, the roads are infested with Japanese patrols, and the group has no choice but to cut across the mountains. The film culminates with the huddled mass of determined children, led by Jeni, marching into the town, their little feet bloodied and covered in bandages from the arduous journey. To keep up the moral of the youngsters, Jeni kept them all singing along to the tune “This Old Man” (with a knick-knack paddywack give a dog a bone). As the townspeople, who had been hoping against hope for the seemingly lost group, heard the children’s song, they all cheer for the long awaited safe arrival that had only been made possible by Aylward. No one could believe that they had made it through the dangerous territory safely (except for Lee, who sacrificed his own life to save the children from a group of Japanese soldiers encountered along the journey). Greeted by Dr. Robinson, Jeni reminds him who she was and how he had once rejected her as a missionary years before, as unqualified. It is not only heartwarming and inspiring, Inn is also a true story that can cause one to reevaluate their priorities and realize what an incredible difference one determined person can make in this world. Here’s to making a difference in any small way that we can! Gosh I have watched that movie with you and mom. I remember it well .I cried alot of course but I do love it too.